In the current post-post-post-postmodernist world (or whatever term they’re using this week), we’re used to the notion that even the more cutting-edge of today’s artists are essentially repeating what has gone on before. This is an impression that one may certainly have of the influential urban artist D*Face, aka Dean Stockton, whose works may at first seem to borrow a little too heavily from pop art great Roy Lichtenstein. But then again, to make such a declaration may be to miss a point. After all, as the British artist asserted in an interview with The Independent in 2013: “The one thing I felt about pop art is it didn’t ever have a strong underlying tone to it – it could just be anything and everything. I definitely felt that about Roy Lichtenstein’s work, it didn’t really have a voice as such that was trying to articulate a view. The closer one scrutinises D*Face’s now-ubiquitous stickers, posters and stencils, the clearer it becomes that the London street artist has, indeed, taken the central tenets of pop art forward. 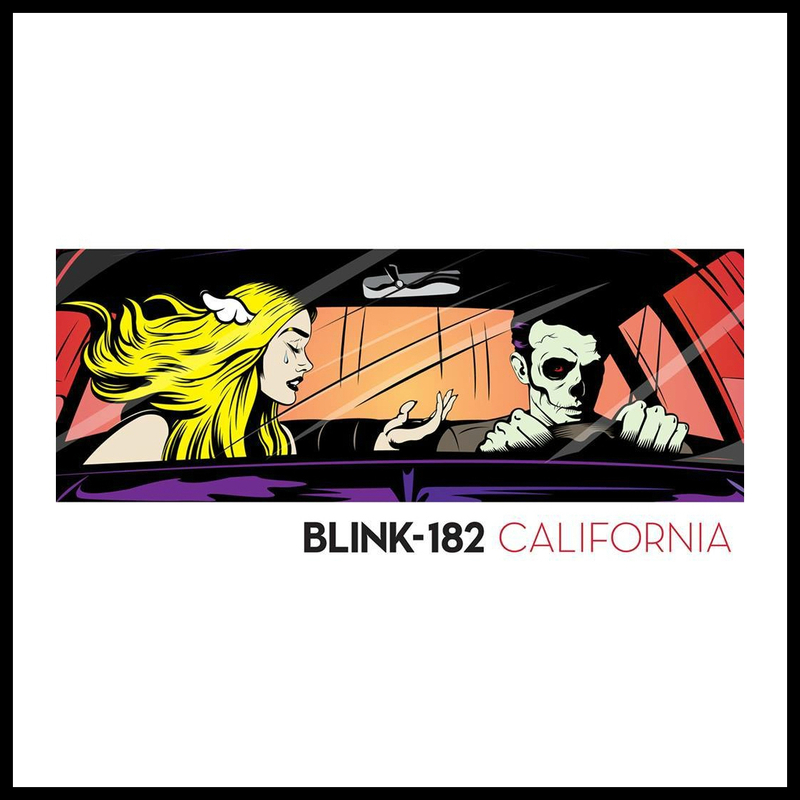 In place of Lichtenstein’s innocuous take on pop, D*Face injects a sinister edge, surely best epitomised by the skulled faces in works such as his album cover art for Blink-182’s California album. Along not entirely dissimilar lines, he collaborated with Christina Aguilera for her Bioniccover art, in which the singer is depicted part herself and part mechanical, drawing comparisons with Arnold Schwarzenegger in the Terminator film franchise and the artwork for Tokio Hotel’s Humanoid album. The extent to which D*Face has permeated both the critical and popular art worlds is quite impressive for a man who started out at a creative agency following his graduation with an Illustration and Design degree, only to become disillusioned with the job’s more commercial aspects. Without his decision to focus on a less compromised artistic vision, one wonders whether he would have ever cultivated the subversive approach to pop art that saw him adopt all manner of iconic images and add his own, often menacing but never uninteresting, elements to them. Arty-Fact: “Ludovico Aversion Therapy / All Your Dreams Belong To Us” was the title of a solo exhibition held in 2009. The title referenced the human behavior reconditioning treatment from A Clockwork Orange (the 1972 cult-classic film by Stanley Kubrick), in which the patient’s eyelids are forced open to watch disturbing footage containing subliminal messages. “Unamerican Graffitti” was one of several faces created by D*Face questioning the increasing turnover and bombardment of imagery by the media as well as how much, if any and what parts, we recall, digest and retain. Any high-profile British street artist to have arisen in the last decade or so will inevitably draw comparisons with that British street artist to beat all British street artists, Banksy – but D*Face is by no means that easily beaten, having exerted his own strong influence on the urban art scene. As with many modern British street artists, D*Face’s story is something of a ‘rags to riches’ one. It began with a childhood in the English capital in which he was inspired by Henry Chalfant’s coverage of New York subway graffiti in Spraycan Art and Subway Art, and continued through teenage years in which skateboard deck graphics in Thrasher magazine were a key influence. 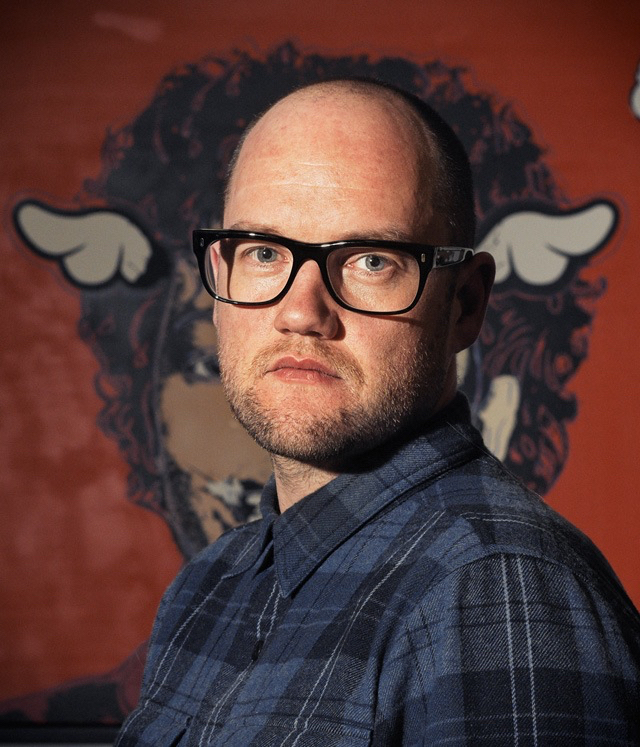 Other sources of inspiration for D*Face down the years have included popular animated cartoons, hip-hop, punk music and fellow artists Jim Phillips and Shepard Fairey, the latter in particular in relation to the iconic “Obey Giant” campaign. 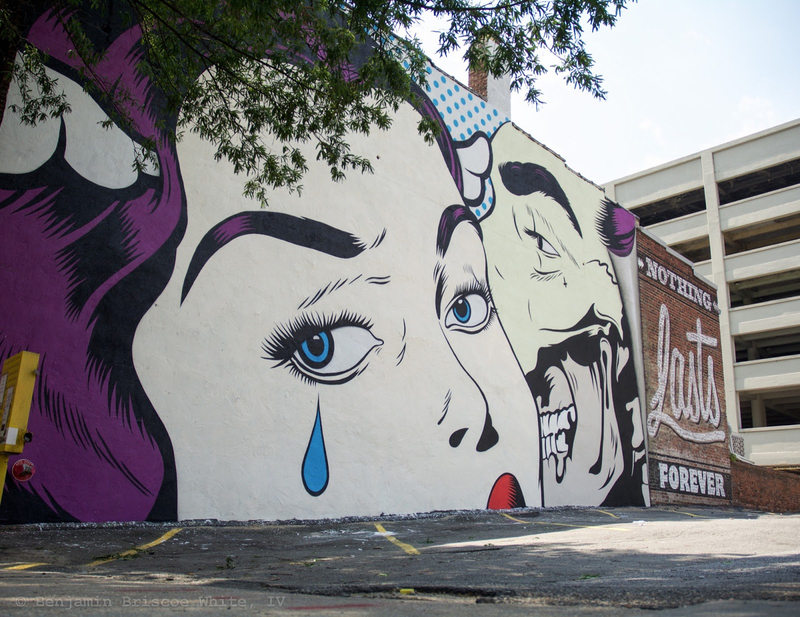 Such influences have all culminated in an approach to street art that goes well beyond the simple appreciation of graffiti or the giants of ’60s pop art, deploying symbolism to question society’s obsession with fame and celebrity. Arty-Fact: D*Face has always had a sense of meaning and something to say, especially on the topic of the personal becoming public and speaking for an entire community. This can be seen in his characteristic make-believe canine, D*Dog, that flies away, free and unstoppable. 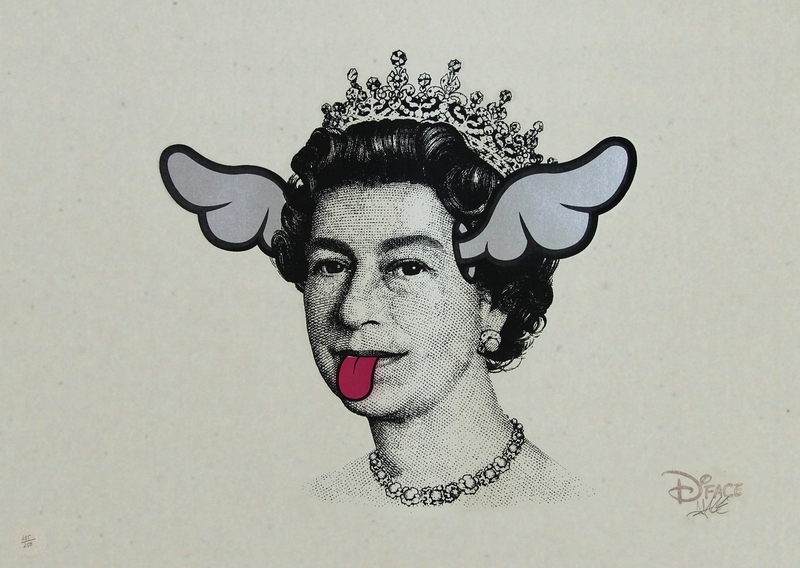 The D*Dog and its mutation into Queen Elizabeth (with wing ears and canine tongue) is an eloquent example of D*Face’s poetics. They are two sides of the same existential condition: grassroots creativity that comes from below and takes flight, and the public icon which from on high – and often through various media channels – imposes codes of conduct, points of view and dictates styles and fashions. And for this reason it must be criticised, contested, weakened and reduced to a simple, fictional, child-like doodle. D*Face mimics many of his pioneering street art contemporaries in also producing painted work on canvas, as well as in achieving true acceptance in the higher echelons of the art world, not least through his establishment of the Outside Institute, London’s first contemporary gallery dedicated to street art. 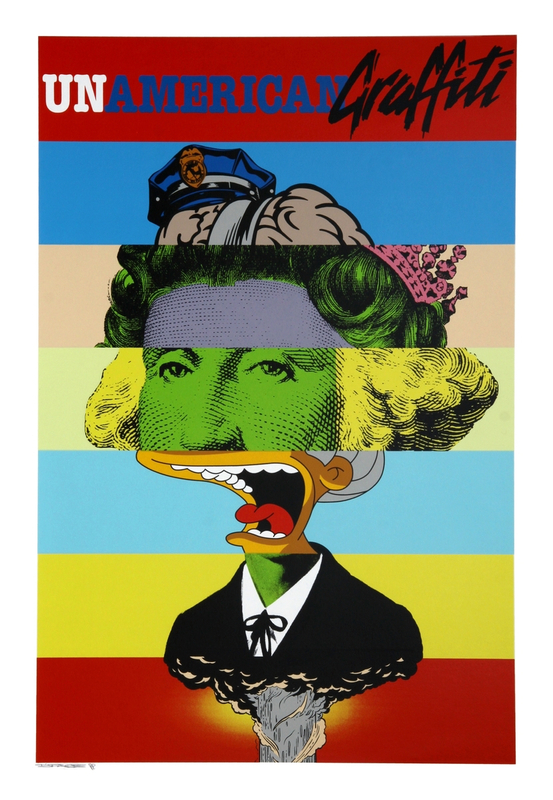 Following a first major London solo exhibition,Death & Glory, at the StolenSpace Gallery – the gallery that the Outside Institute later became – in 2006, D*Face has continued to work, build his profile and attract acclaim, with his works now routinely selling in the tens of thousands of pounds. With D*Face having extended his solo exhibition record internationally in recent years, it doesn’t surprise us in the slightest that Los Angeles art critic Peter Frank once declared: “D*Face is one of Britain’s leading ‘newbrow’ artists, and damn if he isn’t as sharp and clever – if not quite as surreptitious – as Banksy.” We certainly agree, and can only hope that he continues to be so for very many years to come!